SPECIAL TOURS (2.900€): We use as lodgings, if there are places available, the National Paradores network (tourist hotels) (San Marcos in Leon, Villafranca del Bierzo, Tui, Baiona, Pontevedra and Santiago). Private vehicle support and all displacements. Spanish Online mobile phone for every 2 or 3 people. Program information and meter route. Travel Insurance for the duration of the tour. The Portuguese Way has has a peculiarity that many people don’t kwow: the most part of its route runs on the old Roman road XIX. The route XIX dates from the time of Emperor Augustus, and as is described in the itinerary of Antonino, it connected the cities of Bracara Augusta (Braga),Ponte de Lima, Tude (Tui), Turoqua (Pontevedra), Aquis Celenis (Caldas de Reyes),Iria Martiae, Lucus Augusti (Lugo) and Asturica Augusta (Astorga). During our tour we will discover vestiges of this time. It is also a route less traveled by pilgrims than the French Way. This provides us greater comfort and quality in the lodgings that we will use. The meeting point will be in Lisbon at 9 AM. in a place to be determined on each trip. Once we have made presentations, we will go in our private vehicle to “Ponte de Lima”, not without visiting before the biggest pilgrimage center of Portugal: Fatima, the “Altar of the World”. It is an awesome altar prepared for pilgrims who come to Fátima along the year. Porto is also a place to visit and relax. Final of our stage on Ponte de Lima. 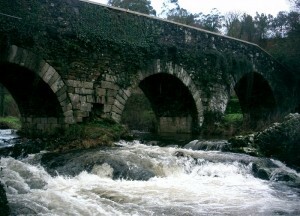 Ponte de Lima – Rubiaes 17,5 Km. Ponte de Lima is waiting for us with its awesome bridge over the river Lima that calls the village. It could be considered, despite the hard climb, the most beautiful stage of the Portuguese Way. Rubiaes – Tui 19 km. From Tui we will say goodbye to Portugal which can be seen in the distance as we move through the city. 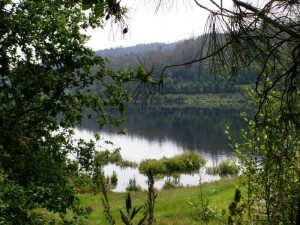 We will pass through eucalyptus forests, plantations Kiwi and the natural space of Gándaras and river Louro. In this moment we arrive at Porriño, a curious bulding, hall of municipality. Porriño – Redondela 15,5 Km. At dawn, o Porrino opens its doors at the municipality of Mos, with entrance in Ameiro Longo, where the Portuguese Way take up again its journey through the N-550 or surrounding by Veigadaña. Later, behind the church of Santa Eulalia and the Pazo of Mos, the journey becomes hard with the climb to the chapel of Santiaguiño and descends through all kinds of tracks, in a very humanized landscape to Redondela, a village of viaducts on the edge of the hidden coast of Vigo. The early stages introduce again the pilgrim in the Galician landscape minifundista. After a panoramic view of the Vigo estuary, next to the first hill where the evocative ruins of a boarding house lies, the Way enters in the municipality of Soutomaior by Arcade, famous for the quality of its oysters. Ponte Sampaio over the Verdugo River and the disappeared Ponte Nova open the doors to the Brea Vella da Canicouva, a path of large irregular slabs that leads us to the second hill to access the municipality of Vilaboa. After crossing the parishes of Santa Comba of Figueirido and Bértola we arrived at the chapel of Santa Marta to take the road to Pontevedra, a final stretch somewhat monotonous for wich there have appeared no official alternatives. To leave Pontevedra, we will go through all the historic center of the city until Ponte do Burgo over Lerez River. After this ford, the Way access to the tiny villages of the parishes of Santa María de Alba and Cerponzons and reaches San Amaro, first village of Barro, through a cool and motley path. The fleeting walk by the municipality of Portas, with the villages of Barosa and Briallos , leads the pilgrim to an endless stretch of tracks almost shadowless which ends at the entrance of Caldas de Reis, spa town watered by rivers Umia and Bermaña. Caldas de Reis – Padrón 18,6 Km. Stage comfortable as previous ones, and and again characterized by the Galician countryside, with its houses located in either place without being precise village settlement and oak woods, cornfields and cruises. The roads and highways cross the landscape like scars. The municipality of Caldas is followed by the Valga ones, with the amazing Mount Albor, and Pontecesures, where the province of Pontevedra gives way to La Coruña. The visit to Padrón and Iria Flavia at morning, convert to Portuguese Way into a special experience. As we know, according to legend, in those places disciples disembarked with the body of Apóstol Santiago in the year 42 or 44 of our era says. Padrón – Santiago de Compostela 23,7 Km. A high density of a small village settlement, confirms the close presence of our destiny. The last stage can be divided into two halves, the first nearly flat to Teo and a second more fatiguing to the cathedral. It runs through the municipalities of Padrón, Teo, Ames and Santiago and can be walked comfortably in less than 7 hours. 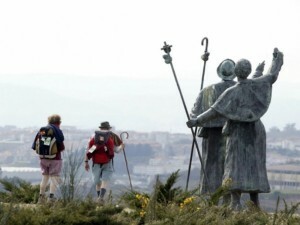 The itinerary revives the hazardous journey of the disciples with the body of Santiago from the disembarkation to the burial in the Campus Stellae. An odyssey that evokes mountains and wild bulls and characters such as Bishop Teodomiro and Queen Lupa. 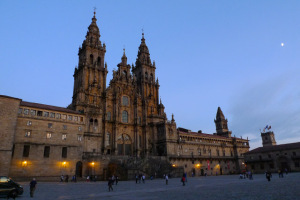 In the morning we will have a guided tour of Santiago for our group. 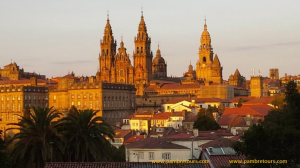 We will focus our visit on the old quarter of the city where we can have a better understanding of history and the pilgrimage to Santiago through its monuments, squares and streets. During the tour we will visit the Cathedral, where besides its history and building, we will talk you about the most important traditions. End of our Tour. Approximate hour: 1pm. Beginning of your new way.